https://magicfunwagon.com/wp-content/uploads/2018/02/MagicFunWagonLogo.jpg 0 0 Magician https://magicfunwagon.com/wp-content/uploads/2018/02/MagicFunWagonLogo.jpg Magician2018-02-26 17:58:222018-06-16 16:21:09How To Do 5 SIMPLE Magic Tricks! What is a Magic Fun Wagon? 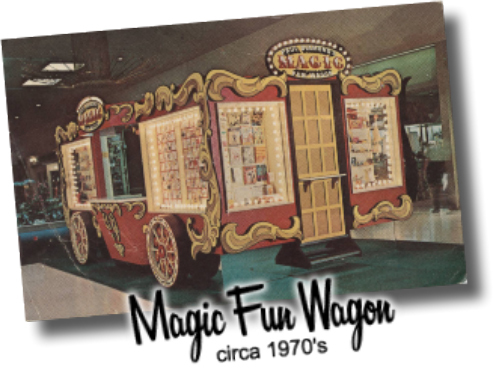 The Magic Fun Wagon was a free standing shop or kiosk that operated in the West Palm Beach Mall in Florida during the 1970’s. It was ornately decorated to appear as a circus wagon on wheels and to help that illusion it had a mirror base. At first glance it looked like it could be wheeled away at a moments notice to join a circus parade. The windows surrounding the outside displayed an incredible selection of magic tricks, books, gags, and Halloween items. For such a small store it was able to pack an almost endless supply of wonder and entertainment. On each side there was an opening with a counter that doubled as a stage where you could ask to have a trick or illusion demonstrated for you before you decided on your purchase. I was one of those lucky enough to work in the Magic Fun Wagon and I was Magical! There is a process in the making of a Magician, it doesn’t happen overnight and in many cases it begins in childhood. As a child you are a ready and willing participant in the belief that the impossible is possible and that Magic is real. It doesn’t take much to fool a child but from a child’s perspective Magic is not a foolish pursuit. No, magic to a child is as real as anything and is an absolute joy to behold. I can still remember with clarity the first time I saw a Magician perform, it was on a TV show called The Magic Land of Allakazam with Mark Wilson. He performed this one trick where he made a coin disappear in the air right in front of me. I was dumbfounded and couldn’t believe what I had just seen. The only thing I could imagine was that there was an invisible box that was suspended just above his head where placed that coin to make it disappear. But what happened that day that was even more amazing, I began to realize that the real world had a kink in it and I just discovered a door to wonderland. Nothing that was taught in school or by my parents had prepared me for this Magic thing. How could this possibly exist and why hadn’t anyone told me about it before now? It was probably a couple of years later before Magic re-appeared in my life with acquisition of a D. Robbins E-Z Magic Catalog (this company has been in business since 1916 and is still at it). I had never seen anything like it, page after page of magic tricks and illusions. Books on Magic, Magic props, and even flaming Magic. All of the descriptions were equally amazing and I read each one several times trying to discern how they were able to make such miracles happen. So I saved my allowance money and after weeks of agonizing over my Magical selections I filled out the order form and placed it in the envelope with my payment. A single stamp and then into the mailbox and so began the endless waiting. A wand will slowly rise when held in your hand, or will suddenly leap into the air. Can also be used in your magic act. Impress your friends and family with this great magic illusion. Wow, I could use it in my Magic act, that was an important thing to know. This had to be real Magic and to think that a kid like me would soon have it in his hands, a magic wand that could slowly rise or better yet suddenly leap into the air. I could barely contain my excitement and the anticipation was killing me. The package finally arrived and after tearing it open I grabbed the Rising Wand in one hand as I read the instructions in the other to reveal the secrets of how this miracle I just purchased worked. As I read the instruction sheet a wave of disappointment fell over me, my shoulders slumped and I let the Rising Wand fall to the floor with the rest of the tricks that would no doubt also shatter my illusion. It wasn’t Magic, it wasn’t something special, it was just stupid tricks. They weren’t Magic, it was just a bunch of props and it was so obvious how they worked there was no way I could fool anyone with this disappointing collection of junk. I couldn’t believe that what I read in the catalog could even be the same thing as what I now held in my hands. There had to be something wrong, they must have sent me the wrong package, I was supposed to get the package with the Magic. I was just a kid and this was not what I was expecting, I was so hurt I even complained to my Mother! She called the company to complain and I’ve sure they were used to getting calls from disappointed kids mothers because she told me that they couldn’t take back any of the trick because I now knew the secrets of the tricks and it wouldn’t be fair. Fair, they actually said it wouldn’t be fair? I was resigned to the fact that I wasn’t getting my money back so I just threw the box of magic tricks into my closet and closed the door. My back was to the wall and I had to do something otherwise I would never hear the end of is from my siblings. Maybe I could put together some form of entertainment with that crappy box of tricks. So I sat down with my box of disappointment and started to read all the instructions. I can’t remember all the magic tricks I had in that box or even what kind of Magic show I put together but there was one other item I do remember other than the Rising Wand and it was the Phantom Napkin. The Phantom Napkin, according to the instruction sheet, allowed you to vanish and then make reappear small items. I really didn’t believe that anyone could be fooled by such a lousy trick but I added it to my Magic show anyway. In fact I decided to put my pet mouse into the show as he was about the size of a small item. My first Magic show was excitedly anticipated by my family but because I knew it really wasn’t Magic but just a bunch of tricks, I was hoping they wouldn’t be too disappointed. It would be the first time I had the attention of my entire family at the same time so I practiced the tricks and followed the patter as each instruction sheet described. I was finally prepared and after moving some furniture around I stood before my family ready to perform what I already knew was just a bunch of lies. But I figured if I could just remember all the moves and the patter they wouldn’t be as disappointed as I was. The show was a blur as I reached into my box of tricks and in turn presented each trick with as much enthusiasm as I could muster. The response I got from my family was what you would expect, they were forgiving of my minuscule magical ability and even seemed to enjoy my tedious pause filled patter. The finale was upon me and I had chosen the Phantom Napkin to end the show. To operate the Phantom Napkin is really quite simple, you show a large ornately designed napkin to the audience front and back. You then take the four corners and hold them together forming a pocket so that you are able to reach into the pocket and produce your small item. What happened instead was before I got a chance to reach into the folded napkin to retrieve my mouse who was secreted in inside, he decided as if on cue to climb out of the napkin and onto the back of my hand. And then something happened that puzzled me. My family was clapping and crying out in amazement. For a second I couldn’t understand why they would be clapping for such a stupid trick. It was so obvious to me how it worked and I didn’t understand what it was they saw. I just stood there in amazement as they continued to smile and congratulate me. And then it dawned on me, it wasn’t the trick they saw, it was the Magic they saw. From their perspective the mouse coming out of the napkin was Magical not some dumb trick napkin. That was the secret and it was something I already knew but had forgotten, Magic is real if you believe in it. I didn’t buy a box of stupid tricks I bought a box of real Magic and it was Magic just like I had seen those many years ago on TV. All I needed to do was to see through the eyes of someone who believed in the Magic of the performance. I still have that Phantom Napkin and to this day my sister still remembers, with wonder and delight, the day I made a mouse appear as if by Magic. https://magicfunwagon.com/wp-content/uploads/2018/02/MagicFunWagonLogo.jpg 0 0 Magician https://magicfunwagon.com/wp-content/uploads/2018/02/MagicFunWagonLogo.jpg Magician2008-09-02 20:47:462017-09-29 21:36:04What is a Magic Fun Wagon?